A cutover strategy defines how the Operator will physically switch from their current signaling system (usually conventional) to CBTC. The cutover strategy has no impact on operations once the system is fully cutover but, if the strategy is not planned, the CBTC rollout will be cumbersome for the Operator and the riding public. In this post, I cover the big bang approach. As the name implies, on a Friday before the cutover weekend, the line is running under conventional signalling and on Monday, the day after cutover weekend, the line is running under CBTC signalling. The big bang approach requires a high degree of confidence the solution will perform almost flawlessly once deployed but, as is the case with any beta software, bugs always surface. Nevertheless, this is a valid approach and it has its advantages if the Operator can tolerate the disadvantages. When the big bang approach is utilized, the legacy signalling equipment is taken offline (decommissioned) and the CBTC equipment is brought online, except for the switch machines. During the cutover, the switch machines transition from the legacy system to the CBTC system; therefore, a cutover cubicle is required to make this transition smooth (Figure 35). 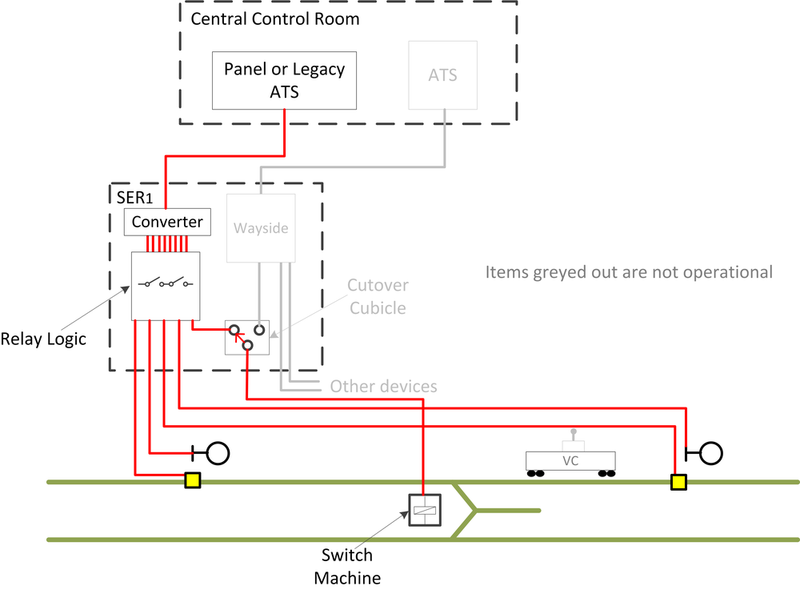 The cutover cubicle allows the legacy system to control the switch machine then switchover to allow the CBTC system to control the switch machine. Any other legacy equipment required by the CBTC system will require a similar cutover cubicle. By the end of the weekend, the CBTC system would take control of Service for the start of Monday rush hour. The legacy equipment would remain until a good time is found for it to be removed. Best for small lines, 5km to 10km where is there is little equipment to cutover. Temporary designs for the cutover are kept to a bare minimum such as cutover cubicles. Logistically simple in the sense that the signals are bagged, trip stops are tied down and the switch machine is cutover. If there are problems with the software logic, the entire line may be affected. Workforce needed for this cutover is large depending on the length of the track. In the next post, I will discuss the phased cutover approach.